Did everyone have fun Shop Hopping this month? WOW! What an amazing month! 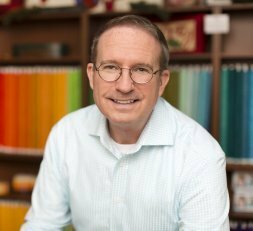 As a new owner, I thoroughly enjoyed meeting everyone, seeing your projects, and listening to the stories that go along with each and every quilt! THANK YOU to everyone who stopped into Creekside Quilting on their shop hop adventures! For me, it was such a fun month! We went through 3 bolts of the white fabric we were giving away for the Movie Star Pattern, 80 fat quarters, 80 fat eigths, and 300 post cards! I think everyone enjoyed the fabrics this year! Great to see so many people come out for the All Iowa Shop Hop! One piece of BIG news for Creekside Quilting, is that starting July 5th, we will no longer be open in the evenings. We will close on Thursday’s at 5:30. Our store hours will be Monday-Thursday 10:00-5:30, Friday and Saturday 10:00-5:00, and Sunday’s 1:00-4:00. So, if that wasn’t enough of “What’s New” at Creekside, let me show you a couple of items that are new in the store this past week. 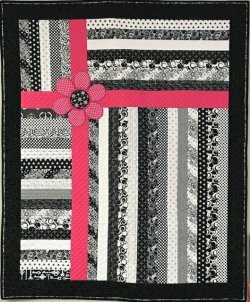 Patty created this darling scissor, journal, and pin cushion from a pattern we have called Sewing Bliss. We have a kit available, along with the pattern. 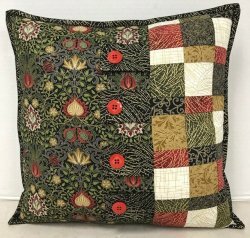 Sue created this darling pillow using our Christmas fabric that came in this month. We have a kit available, along with Sue's Holiday pattern. 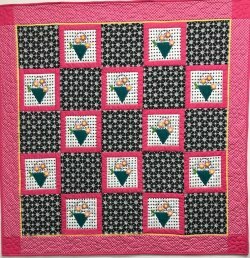 We now have patterns available for purchase for this Simply Pink Quilt by Langer Quilt Designs! 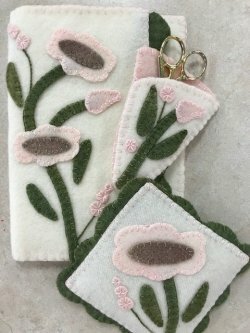 And we now have patterns available for purchase for Patty’s quilt, Baskets of Daisies, that is hanging in the wool room. Can I start this fall? Yes! We will be taking new members for awhile to get the club up and running. The price to join the club will remain at $10 June, July, and August. I don’t know about you, but I have a lot of UFO’s and am really looking forward to this Club! I truly hope you will consider joining! Tracy has brought in the next garment in her series of Garment Construction Classes. The first is the pants, and then comes the top! Both items are on display and are cute, cute, cute! If you have ever thought about constructing your own clothes, or maybe clothes for grandchildren, these classes are for you! Tracy is so knowledgeable and you will learn so much more than any video can teach you. Tracy will start on July 1st, and continue on the 15th and 29th with the pants. We have a Pfaff educator coming to the store on July 19th from 1-4 to do a make and take on the new Creative Icon Embroidery Machine. She is bringing in 11 Creative Icon’s for us to use. The cost is $10 to cover supplies. Please sign up early to reserve your space. I’m very excited for this opportunity! Bring your Patriotic Quilts in, if you would like to have them on display in July in our classroom! To welcome in the 4th of July, let's have this week's coupon be 15% off all full yard cuts of red, white, and blue fabrics. Limit 2 yards per cut. You must show this coupon at time of cutting fabric to receive the discount. Coupon is good 6/26/2018-7/03/2018. FYI: WE WILL BE CLOSED THE 4TH OF JULY!